Earnings, analysts, and weakening commodity prices weighed on Chesapeake Energy, Range Resources, Cabot Oil & Gas, QEP Resources, and Southwestern Energy last month. 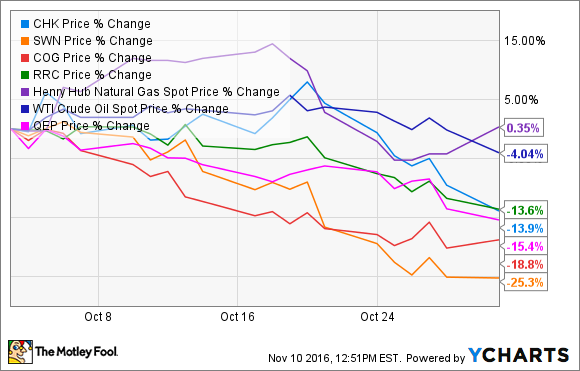 October was a pretty dour month for energy companies. The prices of both oil and gas came down off their highs thanks to concerns about supply and demand. On the supply side, rumors that the OPEC deal might unravel sent oil prices slumping, which crushed oil stocks. Meanwhile, gas prices started to slip on concerns that the upcoming winter might be warmer than normal, which would affect demand and hurt gas producers. October was a pretty mixed month for Chesapeake Energy. On the plus side, the company completed two transactions to improve its capital structure. It issued $1.25 billion in convertible notes and negotiated an agreement to exchange $1.2 billion of its preferred stock for common stock. These transactions improved Chesapeake's liquidity and simplified its balance sheet. The company also had several good things to say at its Analyst Day, noting substantial improvements in its balance sheet, capital efficiency, and future growth profile. That said, some analysts are still leery about its future, including UBS, which downgraded it to sell, citing leverage that's just still too high. Given the decline in commodity prices during the month, investors have that same concern. Aside from weakening commodity prices, third-quarter earnings were the primary driver of Range Resources' October slide. The natural gas producer reported an adjusted loss of $10.4 million, or $0.06 per share, which was wider than the year-ago loss of $0.03 per share. That said, Range Resources' CFO did say that the third quarter "appears to mark a financial turning point" for the company due to rising prices, its recent acquisition of Memorial Development, and efforts to diversify its pipeline transportation agreements. That said, if prices don't continue rising, Range's financial results could start turning lower, which is what investors worried about last month. Earnings, or a lack thereof, was also the primary weight driving down QEP Resources last month. Like Range, its net loss widened, going from $21.1 million, or $0.12 per share, to $50 million, or $0.21 per share, because of weaker commodity prices and higher expenses. That said, QEP Resources did report solid production, with NGL output surging 26% thanks to a third-party midstream provider's decision to continue to recover ethane in the Williston Basin. This solid result gave it the confidence to increase its full-year production guidance. Further, the company closed a $590 million Permian Basin acquisition, adding 430 future drilling locations. Earnings were also a contributor to Cabot's tough month, with it reporting a loss of $16.7 million, or $0.04 per share. While that was in line with analysts' expectations, it was a wider loss than last year's $0.01 per share. Aside from the lackluster quarterly results, Cabot Oil & Gas also found out that the key Atlantic Sunrise pipeline by Williams Companies (NYSE:WMB) will not go into service as soon as expected. Cabot is an anchor shipper on that pipeline, so it will not be able to ship those volumes until Williams Companies completes the project, which won't be 100% in service until mid-2018. Finally, Southwestern Energy was the worst performer of the group after it missed earnings estimates rather badly. While the company earned $12 million, $0.03 per share, that was $0.04 per share below expectations. Weak natural gas pricing and declining production were the primary contributors to the disappointing quarter. Southwestern Energy did note that it expects to generate roughly $1 billion in cash flow next year, assuming commodity prices don't dive. That's more than enough to cover the $700 million it needs to spend so it can maintain the current production level, potentially providing Southwestern with enough excess cash flow to grow production next year. Investors are becoming concerned that natural gas prices could continue to slide, which would impact profitability and production growth at producers. That's certainly a possibility if we get another warm winter. It's something producers and investors hope is not in the forecast, because it could cool these stock off even further.